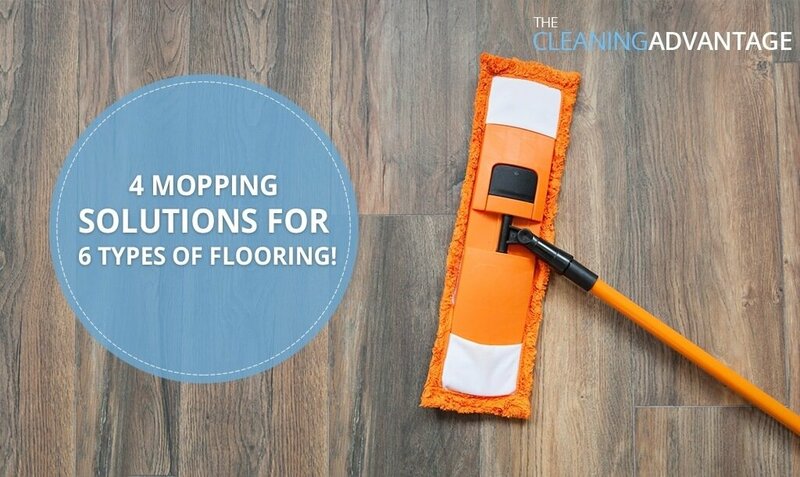 4 Mopping Solutions for 6 Types of Flooring! When you clean your floors there’s always the risk of causing damage with harsh cleaners and unsuitable tools. Appropriate cleaning and maintenance will help keep your floors looking new for years to come. We’re going to share four simple and safe mopping solutions for cleaning five different types of flooring – hardwood, porcelain, linoleum, ceramic tiling and laminate. For hardwood floors we don’t recommend the use of steam mops as popular as they are. Water will damage the floor and cause the wood to buckle over time. While some products and oils are made for older wood floors, those products will leave a residue that can be very difficult if not impossible to refinish the flooring when it is time. New wood flooring does come with a guarantee but certain restrictions may apply. Wood flooring installers recommend that you use a Bona Cleaning Kit designed for wood floors. The way light reflects off porcelain floors exudes a sense of luxury and class. But when your porcelain floors are dirty, it’s fairly evident! The best cleaning solution for getting the dirt out and bringing the sheen back is 1/4 cup of white vinegar; 2 cups of water; and 3-4 drops of regular dish soap. Mix these ingredients in a bowl and pour it into a spray bottle to spritz your floors, mopping as you go! If needed, dampen the mop with warm water and continue mopping. The best-suited mops for porcelain floors are those with microfiber heads. Though they are completely different, the cleaning solution and method for both linoleum floors and ceramic tiles are the same!. First, thoroughly sweep the surface for any loose particles. Then, in half a bucket of water (warm water works best for this), mix in 6 to 8 drops of normal, over-the-counter dish soap and stir it up. Dip your mop in the solution and wring it properly so that it is merely damp and not dripping with water; proceed to mop your linoleum or ceramic tiled floor, then use hot clean water to remove any lingering soap residue. The results are guaranteed to satisfy you! As an FYI Phenol Cleaners are usually Disinfectant Cleansers, both Lysol and Pine-Sol products have it in them. Unfortunately, Phenol Cleansers can be very toxic and unhealthy to use not just for humans, but also for pets, so we do not recommend using them. If you still want to use them, it is very important to follow the instructions on the bottles, but as we said, they are not safe products so we do not recommend using them. Laminate floors today are very beautiful and sometimes it is difficult to tell then apart from real wood; however, they have their cleaning requirements. The safest and effective cleaning solution is one made up of ½ a cup PH neutral cleaner, 4 cups of water and 2 tablespoons of ammonia and bleach-free floor cleaner. Use a spray bottle to spray small sections of the floor and mop accordingly. Do not soak your floors at any point as the water can seep down to the base of the planks causing serious damage to the flooring, which will result in it warping so that the planks separate. Hence, simply spraying the floor with your homemade cleaner and mopping as you go is the best method. Then dry it immediately afterward. These floor cleaning solutions are easier, safer and more effective than you could imagine! Give them a try today, and you’ll understand why!